I’m excited to finally announce this new release and it has quite a story behind it. 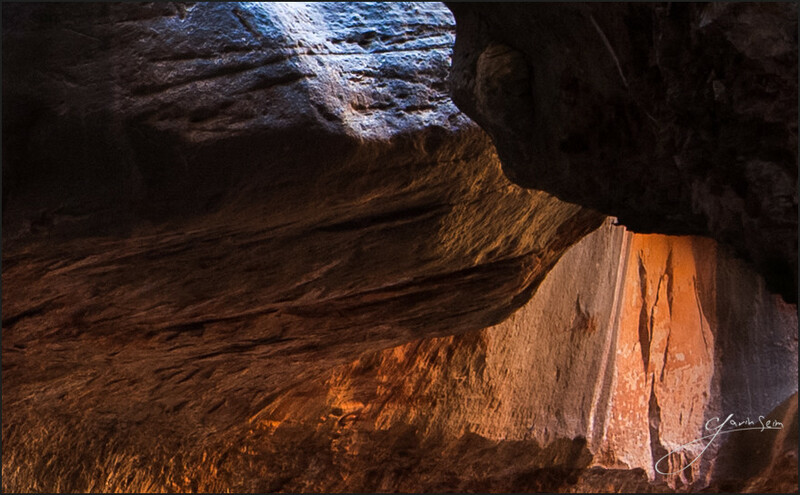 It was the first time we hiked the Subway, a rather legendary, if hard-to-reach spot in Zion NP. Nathan and I started that morning with packs full of gear, three cameras (including our cinema rig) first aid, water purifier and flashlights. It’s around 9 miles round trip and the first three-quarters of a mile takes you down the side of a cliff into the valley. Now when they say this is a strenuous hike, that is the rating of the terrain. The distance is not considered in that classification. There were no groomed National Park trails or picnic tables. Most the time you were finding a route around (and over) boulders and across creeks. It was a long hike with all the gear and between that and the stops we made to film for PHOTOGRAPHICS, we did not reach this grand destination until about 4PM. I knew we would be walking back in the dark, but it also put us in this carved channel of rock when the light was at it’s most glorious. The other hikers were headed back and we were utterly alone as the creek moved across the slippery rock and the leaves fell down from the cliffs above. I did not make many exposures. I just took a breath of awe and took my time considering the shape, line and color and how to best to do it justice. In fact, Nathan was filming the making of this image and and I hope to include it in the new PHOTOGRAPHICS series. The result is just what I wanted. This place is truly incredible and well worth the effort. We made it back mostly in the dark and while we had lights, it was a challenge. I never thought I would be so happy to find that final trail that lead up the side of the cliff. We were in fact so late, that the park ranger was waiting for us when we reached the top wondering if something had gone wrong. But we got the image and much more. Release details: Prints Available.. Order Open Edition mounted prints above.. Master prints and Signature Limited Editions are listed below and can be ordered by contacting gallery. Processing: Lightroom 5, Seim Effects tools., Photoshop B&D. The composition was key. The light was wonderful and being there late in the day gave me that glow down the tunnel. The slick rock had water running over it and it was very hard to move on. Time was short but I made myself analyze the lines. In particular I took my time moving a little bit here or there to get the lines where the upper shadow intersects the blue lit rock in a way that was compositionally appealing and carried the eye down the shaft. After the first comp I had moved here so I could get the pool into the frame. I crawled on my hands and knees because I could not stand without slipping. I managed to get into position and sat in the cool water. I took the time to carefully position and level the tripod head, as I did not want to lose detail do to cropping. I was as the limit of how wide I could go with this lens and I gave special attention to where the frame ended on the left and right so it did not feel chopped off. In post I did not have to do a lot. The detail was astounding as you see below and the light was good right our of camera. I used a preset and some basic tweaking to get the tone more rich and natural from the RAW file and then did some detailed tone work in Photoshop like we discuss in my workshops. It’s razor sharp edge to edge and the long exposure did not cause blurring. I was concerned for this since water was flowing over the legs, but I cupped my hands flowing most of the water around to reduce vibration. The end result is an image that I can find little wrong with. And that is rare. Detail crop where the shadow meets the light. 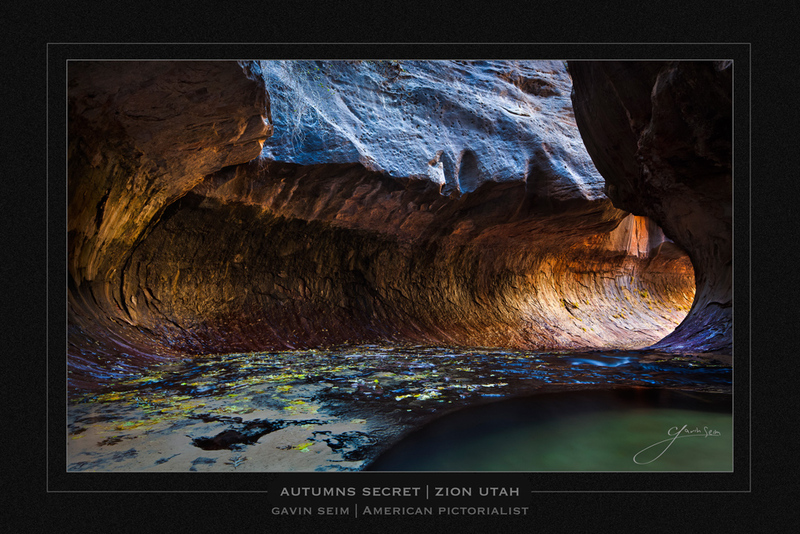 This entry was posted in art study, beauty, color, f164, Fine Art, journal, signature, technique, travel, workshop and tagged 9 miles, amazing photo, c100, cinema, f164, gavin seim, hike, photographics, subway, utah, zion, zion national park. Bookmark the permalink.